Thank you for supporting Andrew Taylor (NMC '19).Andrew Taylor’s (NMC ’19) alarm clock rang at 3 a.m. in his North Hall dorm room. It was a Monday during the 2018 spring semester. That meant a busy day ahead—working his shift for the NMC Grounds Department from 4 a.m.-9 a.m., swinging by the cafeteria for a quick snack, and rushing to his ethics course by 9:50 a.m.
After ethics, there was English until 3 p.m. followed by a trip to the NMC Fitness Center to prep for the physical fitness component of his law enforcement degree. He’d have dinner around 5 p.m. and settle in to his dorm room for a night of studying. That’s how Andrew spent every Monday and Wednesday of the spring semester. Tuesdays and Thursdays, he reserved for eight hour shifts with the Grounds Department. Fridays were for homework. Keeping this schedule, working this hard, was not new to Andrew. His parents divorced when he was young. His mom lost her job at the height of the 2008 recession. Then she suffered from multiple illnesses, leaving her unable to work. To keep the family afloat, Andrew worked 40 hours a week at Burger King while completing high school in Clinton Township, Mich. While working long hours to support his mom, brother, and sister, Andrew kept his sights squarely on his dream: becoming a police or conservation officer. That’s why he chose NMC—for its law enforcement program and proximity to state parks. This spring, Andrew applied for a coveted summer position with the Department of Natural Resources in Traverse City. After submitting his application, he called every single day to inquire about the position. His persistence paid off—the DNR offered him a job. In addition, the State Police Departments in Cadillac/Traverse offered him a summer internship. Andrew knew these positions were critical to achieving his dream, but he worried about the cost. He would get paid for his DNR work, but not for his police internship. Where would he live, and how would he afford rent? Then he’d need gas for his 2004 Dodge Neon to get him back and forth to work, tuition payments for summer classes, and food. Andrew knew the opportunities before him were vital to becoming a police or conservation officer—to achieve the dream he’s had since he was a little boy. But he just couldn’t make the numbers work. Would he have to move back to Clinton Township for the summer, and pass up these opportunities, he wondered? Thanks to your generosity, Andrew could seize these precious opportunities. NMC awarded him a scholarship for the summer semester. The scholarship offset the cost of tuition and renting a dorm room in North Hall. Andrew picked up 15 hours a week for the Grounds Department, which helps him make ends meet and get a discount on his rent. 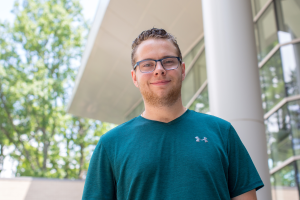 Thanks to you, Andrew took advantage of everything NMC has to offer—summer classes, on-campus living, proximity to state parks, and scholarships for students.